Why pilgrimage? Why Rome? Why now? Why blog? Simply, a pilgrimage is a journey to a place of spiritual importance. Traditionally and historically Christians undertook to travel to a shrine or holy place to venerate a saint or object of spiritual significance – for the good, or possibly the salvation of, their soul. For Muslims the hajj to Mecca is one of the Seven Pillars of Islam. These journeys were often arduous, lengthy and frequently dangerous, and their completion was “rewarded” with some spiritual benefit – an indulgence, or forgiveness of past sins. Today pilgrimage has seen a great revival. Millions go to Catholic shrines – Lourdes, Medjugorje, Fatima, Knock, Walsingham. 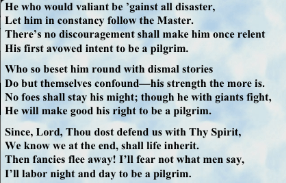 These modern voyages to holy places are often by coach or plane, and the pilgrim stays in a hotel. The great medieval pilgrimage to the shrine of St James in Santiago de Compostela has known a huge growth in popularity in the past two decades, with around a quarter of a million making their way there on foot, bicycle or horseback each year. It is a cliché these days to use the word “journey” to describe a learning experience, but the many who have walked – for example – across Spain or even across Europe along some of the many caminos to Santiago will affirm that it is the process of travelling many hundreds, even thousands, of kilometres that has the most profound and transformative effect on them – rather than the achievement of arrival. The journey is within ourselves. Does one have to travel to somewhere to know the benefits – spiritual, psychological, emotional, physical – that accrue? No, of course not. But a pilgrimage becomes a metaphor for life, with its ups and downs, joys and sorrows, pains and pleasures; with its turning upside-down of plans, its encounters with the unexpected; with the people who cross one’s path, the people with whom one walks a stretch and more, and sometimes the loss of those same companions. As in life, it is how one deals with all of this that bring to light one’s true self, and the necessity of transformation. And there is something about this steady daily plod, the rhythm of walk, eat, sleep; walk, eat, sleep, that teaches a type of mindfulness, a living within the moment. There is space to think, or space to empty one’s head; time to pray; and freedom to just be. There is the liberty of the open road. For me there are other, surprising, benefits: I was an only, and a lonely, child, and I have shall have been a widow for 30 years in 2016. For me to have to share – cramped dormitories, washing facilities, enforced closeness – does not come easily, and is one reason I undertake these trips: it is good for me. There are dormitory companions who snore and fart; there is drenching rain, burning sun, blisters, injuries, bed bugs, missed turnings and miles to return, exhaustion, and food that falls short in amount or nutritious value. It is life in all its fullness, and maybe also a life that gives a minute, privileged, and temporary glimpse into what it is to be less fortunate. Because of this, and because I feel slightly uncomfortable about the morality, or otherwise, of walking south with my nice rucksack and new boots, when so many are struggling in desperation to come north from the horrors of war and starvation, that I have set up two “Just Giving” pages, one for Refugee Action and one for Shelter. These links will take you to them, or you can click on the Just Giving heading in this sidebar. I have now walked several caminos to Santiago (from Vézelay in Burgundy and along the Camino Francés in 2011, the Primitivo through the Asturias in 2012, the Via de la Plata from Seville in 2013, and the Camino Inglés in 2015). Certainly now the Camino Francés is at saturation point, and would-be pilgrims are choosing other routes to Santiago, which in turn will become crowded. So I looked for a road less well travelled. 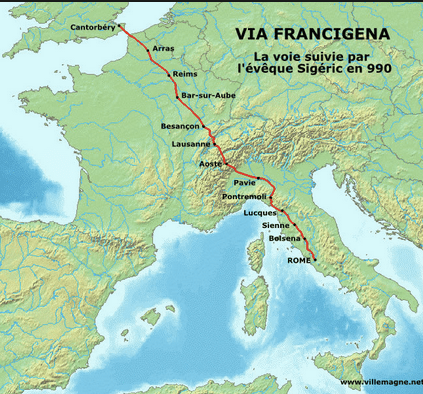 In France and Switzerland the Via Francigena is relatively unknown, and lacking the well-oiled pilgrim infrastructure of Spain, though in Italy there is more by way of recognition, way-marking, accommodation, and walkers. I have never been to Rome. I am a Catholic, and Rome is one of the cradles of my faith, and the seat of the Church in which I have chosen to remain a worshipper, despite its failings, corruptions, abuses and scandals, and my many attempts to break away over the years. I have also spent very little time in Italy in my life, and my Camino experience has taught me that walking through a country is the best way, short of living there, to meet “real” people, glimpse life there without the trappings of tourism. I hope that saying I like a challenge is not pride which might precede a humbling fall. I could get two miles south of Canterbury and have to give up! * The 2000+km will be a challenge physically and mentally. The Great St Bernard Pass is not usually accessible on foot till at least mid-June, and so a departure before early May would necessitate either a wait till snow has melted and the avalanche risk lessened, or taking a bus through the tunnel between Martigny (Switzerland) and Aosta (Italy). However, leaving England in early May will, of necessity, mean I shall be walking through Italy in the heat of summer, as I will allow three months for the journey. The heat may be as big a challenge as the distance. * If I have to give up, I will resume in the future, if – and as soon as – I am able. For many reasons. 2016 marks the 50th anniversary of my spiritual journey from “Canterbury” to “Rome”. I grew up in the Church of England, and was received into the (Roman) Catholic Church in 1966. 2016 also marks 30 years as a widow. And coincidentally, but importantly, Pope Francis declared a Jubilee year – a Year of Mercy – beginning on 8 December 2015 (click on the link for more information). The Door of Mercy in St Peter’s Basilica will be opened, as will many other “Doors of Mercy” in churches and cathedrals, symbolic gestures of reconciliation, and the possibility of forgiveness. 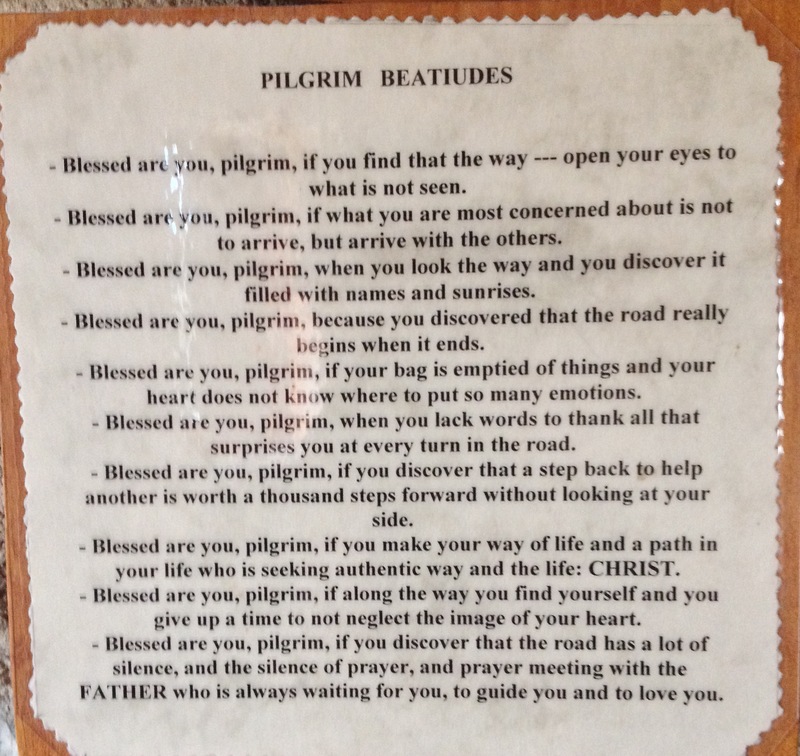 These words won’t be to everyone’s taste, but I think that to recognise one’s need of mercy is to take a first step on a pilgrim road that can lead to wholeness. And I shall be in my 70th year, and walking won’t get any easier. One of my friends is particularly scathing about blogs: they are, he says, self-regarding. Yet it seems to me obvious that the writer who records his sensations and reactions, not only to the physical landscape through which he travels, but to the encounters, the joys, the discomforts, the discoveries must, to a large degree, place him or herself at the centre. The great travel writers – the Freya Starks, the Bruce Chatwins, Laurie Lees, Patrick Leigh Fermors, the Dervla Murphys, and many more – have shared with us the immediacy of their experience. Is this undue self-regard? Quite possibly in some cases: think of Hilaire Belloc, who went before me on the path to Rome. For him it was undoubtedly a true pilgrimage, and yet he is himself exuberantly and ebulliently the focus of his journey and its record, and is not modest in sharing them with the reader, with whom he dialogues in imagination throughout the narrative. 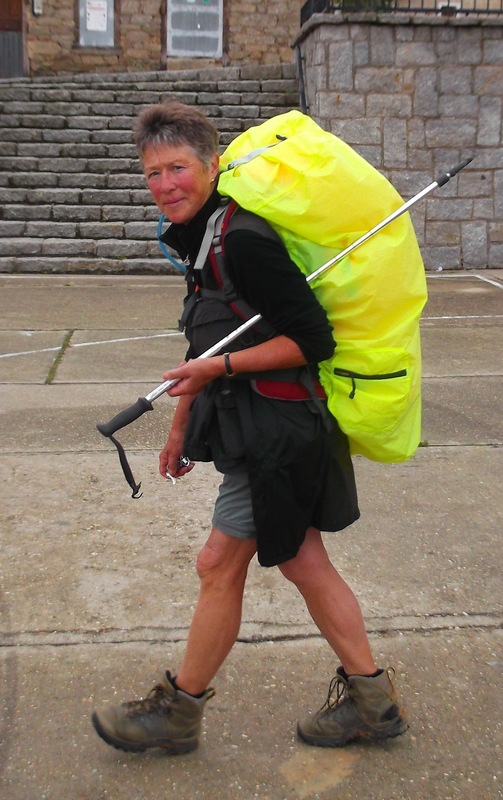 I can’t claim to be as adventurous or as articulate or as ground-breaking, or as interesting, as these great precursors of the travel blog, but I hope there may be some value in the record of a journey of 2083km on foot undertaken by an ordinary woman in her 70th year. So – personal stuff out of the way – an apologia pro via mea. Traveller, there is no path. Thankyou Mary very intresting and inspiring .great design and website set up.i can’t wait to hear about your jorney .idid not know about the pope opening up the bricked up door…. Mary, have a look at http://jayoe.com, it’s Matt’s site ! Jayoe is chineese for ‘add fuel’ and Matt is going around the world on a 3 wheel trike. Enjoy Rome when you get there!